‘Ail’ and ‘ale’ are homophones. They sound the same and have similar spellings. While they are both Germanic words, they have never shared a root word, even back to Proto Indo European. The word ‘ail’ is most often a verb. It is not often used, since it’s an older word and seems to be more formal than informal. When it is used in a transitive way, or when one thing is affecting another, it is used in interrogative or indefinite speech. That is, it’s used when someone is asking a question or to specify an unclear noun. As a transitive verb, it means to cause someone to suffer, to trouble someone, or to otherwise afflict them in some way. It’s not common to see something definite used in this way: “influenza ails me” would not be correct. As an intransitive verb, it means that the person is suffering from an affliction. ‘Ail’ can be used as a noun, which would be a disease or something else that troubles a person, but it’s more common to see ‘ailment’ as the noun form. There is also an obsolete adjective form, which means ‘painful’ or ‘troublesome’. This has not been used in a long time, but it might be seen in older texts. ‘Ale’, on the other hand, is an alcoholic beverage, which is now known as a type of beer. Historically, the word referred to a beer that was made without hops, which are a bitter or zesty flower. Traditionally, ale or beer was made from a mixture known as gruit, which was a bitter blend of herbs. Between the 11th and 16th centuries, hops became more common across Europe and gruit was phased out. In the 16th century, people started to distinguish between ale, which was made with gruit, and beer, which was made with hops. Today, ale is a type of beer. There are three main types of beer: ale, lager, and lambic, which are distinguishable by the type of yeast they use and the process used to ferment it. Ale is made with a warm fermentation, or top fermentation process, while a lager is made with cool fermentation and lambic relies on spontaneous fermentation. Warm fermentation is just what it sounds like. In order to allow the yeast to convert the sugars in the brew to alcohol, the brew is kept at a warm temperature. This process usually creates foam on top of the ale. It is known as top fermenting, as in the past, brewers would collect yeast from the top of the liquid and then use it for the next brew. Today, most brewers do either type of fermentation in machines that collect yeast from the bottom. Cool fermentation uses a different type of yeast, which comes from Bavaria and is known as lager yeast, which ferments at a much cooler temperature. The process takes longer, but it does produce a different flavor than warm fermentation. Spontaneous fermentation uses yeasts that were originally found in the wood of the barrels instead of applied to the brew, as in warm and cool fermentation. This is similar to how wine was made. However, modern technology has picked up the yeast necessary for this type of beer and it can be added in with the brew. This process can take up to two years. To summarize, the word ‘ail’ is primarily a verb that means to suffer from a condition, or to cause someone or something to have that condition. 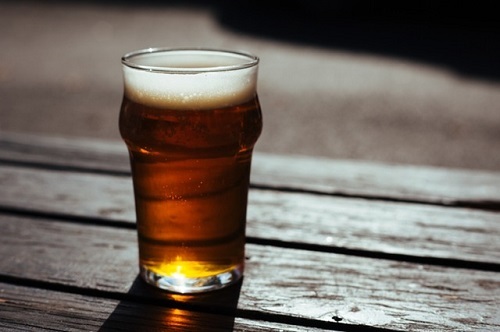 Ale is a type of beer that is made from a warm fermentation process. Kianna. "Difference Between Ail and Ale." DifferenceBetween.net. June 8, 2016 < http://www.differencebetween.net/language/difference-between-ail-and-ale/ >.